Play Mario games all your life and you’ll come to understand a few facts about the universe that the portly plumber lives in. Coins can float in the air, skeletal turtles can reassemble themselves if stomped and while Thowmps will attempt to crush you if you stand too close, Piranha Plants will only emerge from their pipes if you stand far away. Since Super Mario Bros. 3, Mario has been plagued by ghosts called Boos — originally Boo Didley, in keeping with a sometimes-used theme of allusions to famous musicians. The ghosts are famous for appearing shy, even covering their faces, when a character faces them but immediately turning vicious when the character turns away. 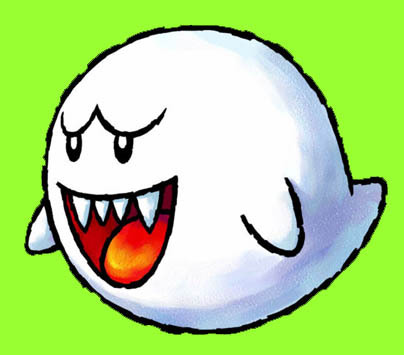 Like many bit players in the Mario games, the Boos became popular enough that they eventually graduated to the roster of playable characters in the spin-offs. In 1999, Nintendo released Mario Tennis for the Nintendo 64, and Boo was among the selectable netters. What’s interesting about Boo’s arrival is how news of it hit the then-nascent world of gaming news blogs: When the list of characters went online, it retained the Japanese names, causing series villain Bowser to be Koopa, stalwart Mushroom Retainer Toad to be Kinopio, and Boo to be Teresa. You see, the Japanese name for this creature is a pun on one of several Japanese words referring to being shy. (It is not, as I originally wrote, the Japanese word for “ghost.”) Most American gamers weren’t aware of this or even that the character would have been called anything different in Japan. Just scanning over the list, many ended up thinking that the series had somehow gained a new female character named Teresa — a possibility that wouldn’t have been unlikely, given that Mario Tennis introduced Waluigi, the evil version of Luigi. (Waluigi’s name also warrants a mention, I suppose, but I already talked about it here, so go look at that.) Eventually, everybody realized that the ghost was just the regular old Boo character, that Teresa wasn’t a proper name, and that no new female character would appear. The ghost has remained Boo ever since. I’ve always enjoyed this example of the confusion caused not only by two languages having different words for the same idea but by one language’s word having an entirely unrelated meaning in another. A common female name here has a decidedly unusual meaning in Japan. I can’t help wonder if a woman named Teresa might encounter strange reactions while traveling in Japan. Teresa doesn't mean ghost in Japanese! Obake is the word for ghost. Teresa is a pun on the Japanese verb tereru, "to be shy/embarrassed" or maybe the word tereya, "a shy person", both of which refer to the Boo characters' behaviour of only chasing after Mario when he isn't facing them and shyly covering their faces when he looks at them.